FANS OF DIRECTOR Wes Anderson will have the opportunity to examine props from his latest film Grand Budapest Hotel up close in Dublin. Annie Atkins, who was the lead graphic designer on the film has loaned the items to the Light House Cinema in Smithfield for an exhibition opening on Friday. Dublin-based Atkins worked with Anderson on set in Germany to design every minute detail of the fictional world of Zubrowka. Generally when you make graphics for film you have to give the propmaster six copies of everything… or 30 it’s something that’s going to get covered in fake blood on set. So I kept one of each graphic prop that I’d made. So the Light House Cinema now has them on loan and is going to exhibit them from this Friday until 24 March. 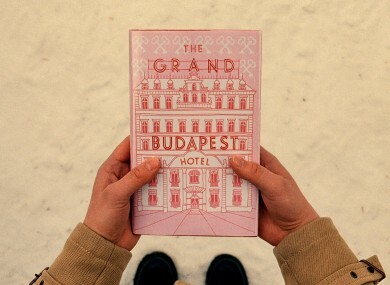 You can see the pink Mendl’s pastry boxes, a copy of the Trans-Alpine Yodel, a love letter with Tilda Swinton’s lipstick kiss… my favourite is the book itself: the Grand Budapest Hotel hardback that opens the movie. Grand Budapest Hotel stars Tilda Swinton, Adrien Brody, Jude Law, Ralph Fiennes, Bill Murray, Jeff Goldblum, Saoirse Ronan, Owen Wilson, Edward Norton, Jason Schwartzman and Willem Dafoe. Phew. The Light House Cinema is also hosting a Wes Anderson fancy dress party this Friday evening to celebrate the film’s opening. It’s expected that several Margot Tenenbaums, Fantastic Mr Foxes and Steve Zissous will be in attendance. Email “Actual props from latest Wes Anderson film on display in Dublin ”. Feedback on “Actual props from latest Wes Anderson film on display in Dublin ”.